Born in Canterbury, England in 1965, Tacita Dean studied fine art at Falmouth School of Art (1985-88) and later at the Slade School of Fine Art in London (1990-92). 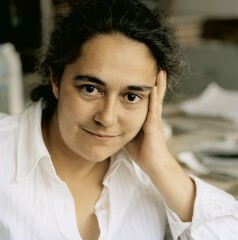 She moved to Berlin in 2000, initially to take up a DAAD scholarship. Dean has exhibited worldwide, in biennials and in numerous group exhibitions. Recent solo exhibitions include: The Friar’s Doodle, Museo Nacional Centro de Arte Reina Sofia/ Abadia de Santo Domingo de Silos, Spain (2010); Kurt Schwitters Prize 2009, Sprengel Museum Hanover (2009); Still Life, Fondazione Nicola Trussardi, Milan (2009); and Tacita Dean, Australian Centre for Contemporary Art, Melbourne (2009). The sea has been a recurring motif in her work and has been the subject of a number of site-specific commissions, including Disappearance at Sea, shown in the lighthouse at Berwick-upon-Tweed as part of the Berwick Ramparts Project in 1996, and Amadeus (swell consopio) made for the Folkestone Triennial in 2008.